GSCE results in Northern Ireland have continued to improve, with girls widening the performance gap from boys. 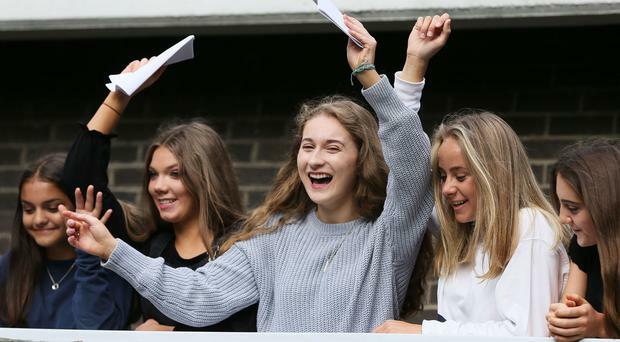 The overall percentage of students obtaining the top A* grade rose by 0.7 percentage points to 10%, while those obtaining grades A* to C increased by 0.4 points to 79.5%. More than 30,000 students sat GCSEs this year. In English, the percentage of entries achieving A*-C grades increased by 1.8 points to 79.6%. In maths, A*-C grades rose by 1.5 points to 66.4% of entries, returning to 2015 levels (66.6%) after a dip last year. A small number of students (around 3%) in Northern Ireland received results in numerical format this year, with 9 being the highest mark and 1 the lowest. The new scale applies to English literature and maths qualifications offered by a number of English exam boards. Their performance has been incorporated into the overall performance figures. In terms of the gender breakdown, boys and girls recorded improved results on last year, but girls' rate of improvement was more marked. A total of 83.5% of girls gained a grade C or above - up 0.6 points on last year. Boys improved by 0.1 points to 75.4%. The gap between female and male performance widened by 0.5 points to stand at 8.1%. There were fewer GCSE entries this year - down by 3.2% from 161,975 to 156,806. The Stem (science, technology, engineering and maths) subjects grew by 0.5 points, accounting for almost a third (32.2%) of entries. The increase was driven by growth in subjects such as computing (up 21.4 points) and physics (2.5). There were decreases in overall entries in biology (down 4.1 points) and chemistry (down 4). Justin Edwards, chief executive of Northern Ireland's awarding organisation, the Council for the Curriculum, Examinations and Assessment (CCEA), said: "I offer my congratulations to the many students receiving their GCSE results today. The results this year reflect the hard work of young people and the support they receive from teachers across Northern Ireland. "Whilst we are entering a period of change in the way GCSEs are graded across the UK, it is reassuring to note that Northern Ireland candidates continue to achieve high outcomes in comparison to England and Wales." Due to the powersharing crisis at Stormont there is no education minister in post to congratulate the students. That task was left to a spokesman for the Department of Education. "We want to congratulate all those getting exam results and moving on to the next stage of their education, whether in school, college, university or in the workplace," he said. "Performance of local students in school examinations - A-levels, GCSEs, and their equivalents - remains strong and is a tribute to the efforts of students, teachers, parents and carers. "These results can be relied upon by colleges and universities, by trainers and employers, as confirmation of the attainment of our young people. It is also important that we continue to work to increase the number of young people getting a good, sound, general education as reflected in their GCSE grades. "Whilst the focus at this time is on results, it is also important to remember that education is about so much more than exams. "The calibre of our young people, their personal qualities and attributes, are not to be summed up just by their exam results. Working with pre-schools, schools and colleges during their time in education, our young people have fostered skills, knowledge and understanding, some of which are demonstrated through exam results, but others are only evident as they go through life. "We look forward to seeing their progress through formal education, increasing their contribution to the community and the workplace." Northern Ireland Secretary James Brokenshire tweeted: "Good luck to everyone receiving GCSE results this morning. Hope all the hard work has been rewarded."